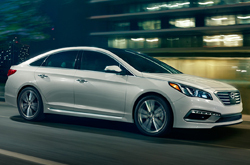 Exactly what makes the 2015 Sonata so impressive? Some say it's the sedan's blend of updated technologies and convenience. Others point to its expressive new Fluidic Sculpture 2.0 design language and efficient performance. In our opinion, however, it's the fact that Sonata offers the entire package, all of the above and more with few to no compromises for most midsize sedan shoppers. In fact, U.S. News & World Report's 2015 Hyundai Sonata review calls the four-door America's No. 1 Affordable Midsize Car. Take one drive and you'll see why! With a thorough redesign that touches on looks, performance and technology, Sonata's sure to be more popular than ever. 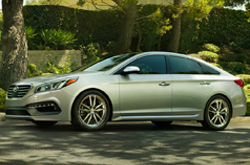 Available in SE, Sport, Limited, Sport 2.0T and two hybrid models (base and Limited), the 2015 Hyundai Sonata in Arlington offers a variety of trim levels for you to choose from. Plus, an all-new efficiency focused Eco model debuts this year, providing a new option for greenies. Depending on the selected trim, you'll have a choice of four efficient powertrains: a 185-hp four-cylinder, 245-hp turbocharged four-cylinder, 199-hp hybrid powertrain and the Eco's new fuel-sipping 177-horsepower turbocharged four-cylinder. With the new Eco engine, the gas-powered Sonata gets hybrid-like fuel-economy estimates, delivering 28 mpg city/38 mpg highway. In its seventh generation, Sonata also offers improved handling and driving dynamics, courtesy of its overhauled chassis. And it's grown slightly larger in size, which benefits rear passengers, who will now enjoy a boost in hip and leg room. In addition, the sedan offers the most overall passenger and total interior volume of any car in its class. Edmunds.com's 2015 Hyundai Sonata review said the previous generation's redesign was "nothing short of a smash hit," and that its current round of changes will continue to keep it "squarely on the radar of savvy car shoppers." We agree and would like to invite you to come see the new 2015 Hyundai Sonata in Arlington, where you can check out its new look, features and performance for yourself. In several areas, the 2015 Nissan Altima, Kia Optima, Mazda 6, Ford Fusion and the Toyota Camry are surpassed by the 2015 Hyundai Sonata. The Sonata's got several positive attributes, including its modern features and sharp looks. 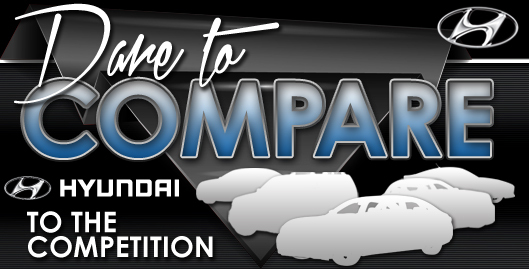 You'll definitely see it's a remarkable value when you compare its price to competing vehicles. The bullet list below will give you even more details about what it offers! 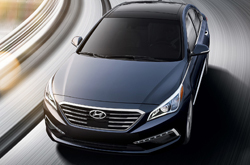 Now that you've read the 2015 Hyundai Sonata review above, please contact Vandergriff Hyundai for a test drive. Don't stress out over your next purchase; look to the premier Hyundai dealership in Dallas-Ft. Worth for thoroughly researched reviews created by industry specialists. Everything perspective car buyers need to make intelligent decisions is right here, including info regarding safety technologies and other specs. Each article is stuffed with helpful facts and specs - all at your fingertips. Now that you've learned all about the 2015 Sonata, we'd love to talk; get in touch with us today to learn about lease offers and setup a test drive!